March 28, 2013 , New York City – The Dodge brand is upping the ante in the fast-growing full-size sport-utility vehicle (SUV) and crossover segments, introducing the new 2014 Dodge Durango at the 2013 New York International Auto Show. This new SUV is built on the Dodge brand’s pillars of performance, style and innovation, delivering a new standard state-of-the-art class-exclusive eight-speed automatic transmission that improves fuel economy up to 9 percent, the Chrysler Group’s award-winning Uconnect Access easy-to-use touchscreen technologies and the Dodge brand’s signature racetrack LED tail lamps to driving enthusiasts in the market for a three-row family performance SUV. When Dodge re-introduced the Durango in 2011, it immediately earned accolades from customers and critics alike. Its combination of sleek yet muscular lines, comfortable three-row seating, large cargo volume, class-leading power, driving range and towing capability and overall driving enjoyment was unlike anything ever seen in the SUV segment before. 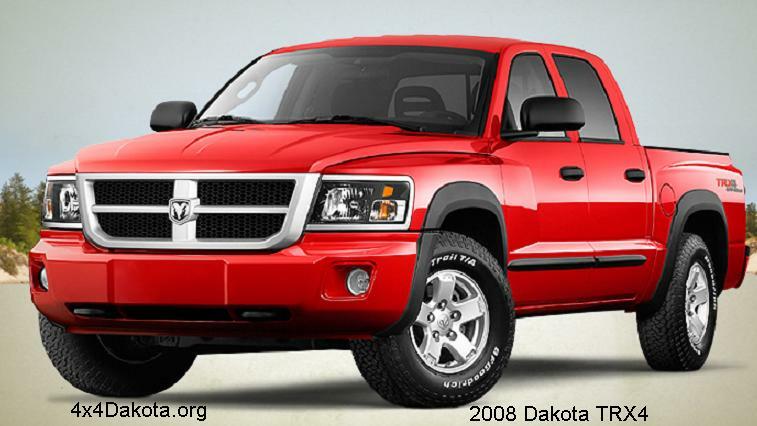 For 2014, the engineers and designers at Dodge have made the ultimate “no compromise” SUV even better. The new 2014 Dodge Durango takes everything that customers love about Durango and adds the latest advancements in technology to enhance its design, capability and functionality. With a new standard eight-speed automatic transmission, improved fuel economy and performance, new LED exterior lighting, two new interior touchscreens, a new programmable instrument cluster, and an available high-definition dual-screen Blu-ray entertainment system, the 2014 Dodge Durango reaches even higher levels of sophistication building on its proven performance, utility and comfort. 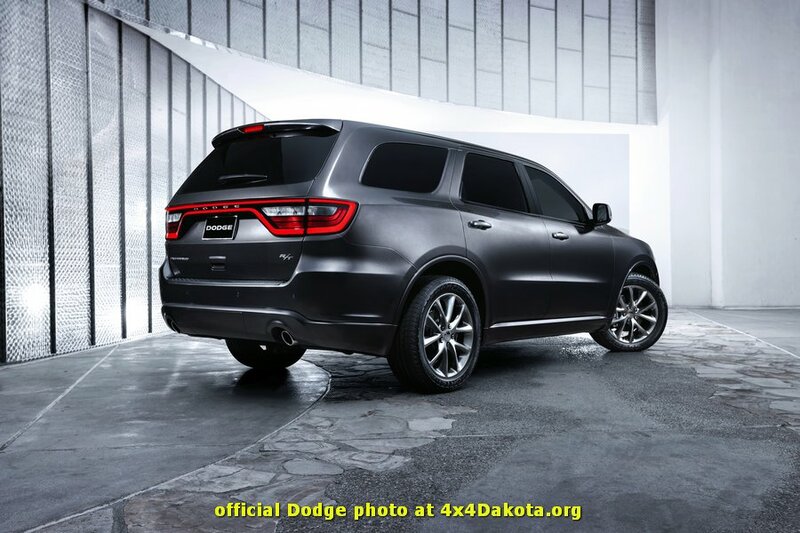 The 2014 Durango is available in five trim levels: SXT, Rallye, the new for 2014 Limited, R/T and Citadel. It will be built in the United States at the Jefferson North Assembly Plant in Detroit. Production is scheduled to begin in the third quarter of 2013. Dodge is introducing the new 2014 Dodge Durango just as the SUV segments in the United States are showing tremendous growth. The new Durango competes in the full-size SUV segment, which with 900,000 units sold in 2012, has jumped 82 percent since 2009. With its standard three rows of seats and interior seating flexibility, Durango also appeals to shoppers looking for a full-size crossover. The two segments combined are up 48 percent since 2009, outpacing the industry. And of those full-size SUV and crossover sales, approximately 60 percent are three-row vehicles, placing Durango squarely in the heart of the market. Durango customers are tech-savvy, youthful and full-of-life, with one of the youngest demographics in the segment. Their active lifestyles keep them on the run, and they depend on technology to keep them connected. The Durango delivers with the latest Uconnect Access technology and connectivity in an agile, flexible vehicle that is spacious with versatile three-row seating for passengers and their gear. 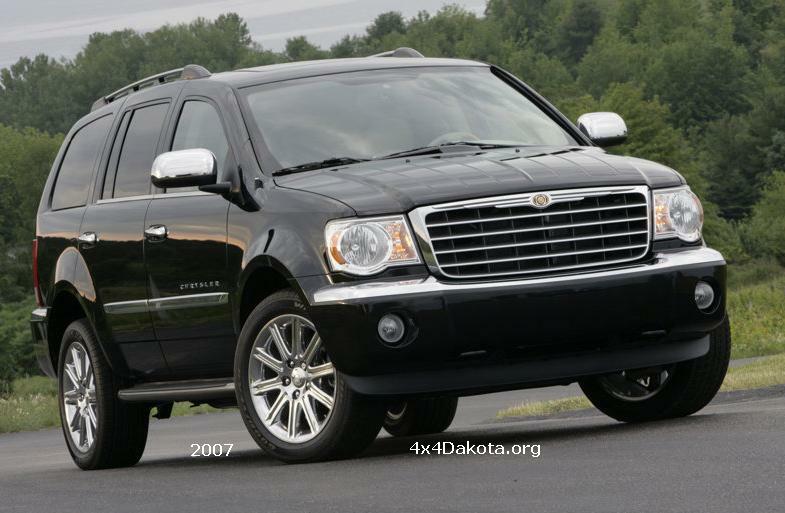 When the Dodge Durango debuted in 2011, it had a distinct advantage over the competition as an SUV designed to deliver performance, without compromising fuel economy. With the addition of the new eight-speed automatic transmission with paddle shifters standard across the lineup, Durango ups the ante delivering improved efficiency, as well as a more refined and engaging driving experience. The 2014 Durango offers a host of premium features, such as high-end interiors, the latest infotainment technology and impressive powertrain options, along with the exterior design that is distinctively Dodge. The Dodge Design team went to work to create a new exterior that conveys how advanced the Durango is, while maintaining the muscular body and confident personality customers expect from Dodge. The new face of Durango is still distinctly Dodge and features a new, slimmer “split crosshair” grille with mesh textures unique to each trim level. Combined with the redesigned projector-beam headlamps and a raised front bumper, the 2014 Dodge Durango has an even more sinister look than the previous model. Durango’s sculpted hood and grille complete the unique to Dodge forward-leaning profile that continues through the deeply browed headlamps. For a more monochromatic appearance, the Rallye and R/T are equipped with dark-tinted headlamp bezels, body-color front and rear lower fascias, wheel flares, grille and sill moldings, all unique to the these packages. The R/T’s ride height has also been lowered by 20 mm, further enhancing its sporty appearance and driving dynamics. The 2014 Dodge Durango now features projector beam headlamps, with LED daytime running lamps on Rallye, Limited, RT and Citadel. The LED lamps run horizontally along the bottom edge of the headlamp and form a unique “hockey-stick” shape. Bi-xenon high-intensity discharge (HID) headlamps are standard on R/T and Citadel, turning the night into day. Auto-leveling technology adjusts headlight beam aim for slight changes in elevation. The new front-end design features new projector fog lamps and fog lamp surrounds and matching crosshair grille texture. Combined with the taller front bumper, the new lower fascia gives the 2014 Dodge Durango a wider and more aggressive look. In line with Dodge Charger, the side profile of the Durango maintains its powerful shape, accented by muscular fender arches and curves that flow back in through the doors, resembling the iconic shape of a coke bottle. The greenhouse of the new Durango blends seamlessly into the body, and a body-color rear spoiler significantly reduces drag while adding visual drama to the side profile. The 2014 Dodge Durango receives all-new 18- and 20-inch aluminum wheel designs for every trim level, and feature finishes ranging from silver painted to polished aluminum to class-exclusive Hyper Black. In total, there are seven wheel designs and finishes to select from. The rear of the Durango sees the addition of the dramatic LED racetrack tail lamp design inspired by the Dodge Charger and all-new Dart. Still immediately recognizable as a Durango, this latest evolution of the racetrack design features a new technology that blends the individual LEDs into one seamless looking ribbon of light. In total, there are 192 LEDs in the new tail lamp assembly that give Durango a presence on the street and make it instantly recognizable as a Dodge. The rear fascia has been re-sculpted to fully integrate the trailer hitch. This gives Dodge Durango a cleaner, more premium look. Large 3.5-inch dual exhaust tips are standard on V-8-equipped vehicles, including the R/T, along with the Rallye; other V-6 powered Durango models have a 3-inch single tip. The new 2014 Durango continues to deliver excitement and refinement with world-class suspension and performance. Benchmarked against premium performance SUV’s in the market, Durango delivers modernized refinement with electronics, suspension and structural characteristics that are usually found at much higher price points. The unibody structure is built with a selection of high-strength and ultra-high strength steels that improve driving dynamics by integrating the suspension with the body — reducing flex and weight when compared with body-on-frame designs. Dodge Durango delivers on the pavement with aggressive shock and spring rates and large sway bars to handle body roll in hard turning maneuvers. Electro-hydraulic power steering, unique caster and camber settings along with standard electronic stability control also contribute to maintain tire grip and vehicle stability. The 2014 Dodge Durango’s rear-wheel-drive-based drivetrain is the foundation for its outstanding on-road driving performance. Available all-wheel drive (AWD) further enhances driver confidence by leveraging the SUV’s 50/50 weight distribution. The Durango’s two AWD systems – one for the HEMI® V-8 and one for Pentastar V-6-powered models – greatly enhance the vehicle’s traction and handling by delivering a smooth driving experience on a wide range of road conditions. While competitors have switched to front-wheel-drive car-based platforms, the HEMI-powered AWD Durango features a low-range transfer case with a neutral position. Low range improves light off-road performance and helps ease maneuvers, such as pulling a boat up a steep launch or backing up with a trailer. The neutral position in the transfer case allows the vehicle to be flat-towed without damaging powertrain components. A robust structure, impressive braking and unexpected stability also contribute to the Durango’s best-in-class trailer tow capability. On models equipped with the Pentastar V-6 engine, the Durango can tow up to 6,200 pounds. When coupled with the 5.7-liter HEMI V-8 engine, the new 2014 Dodge Durango offers trailer tow capability of up to 7,400 pounds – more weight than a 24-foot boat and trailer, and up to 65 percent more than the competition. 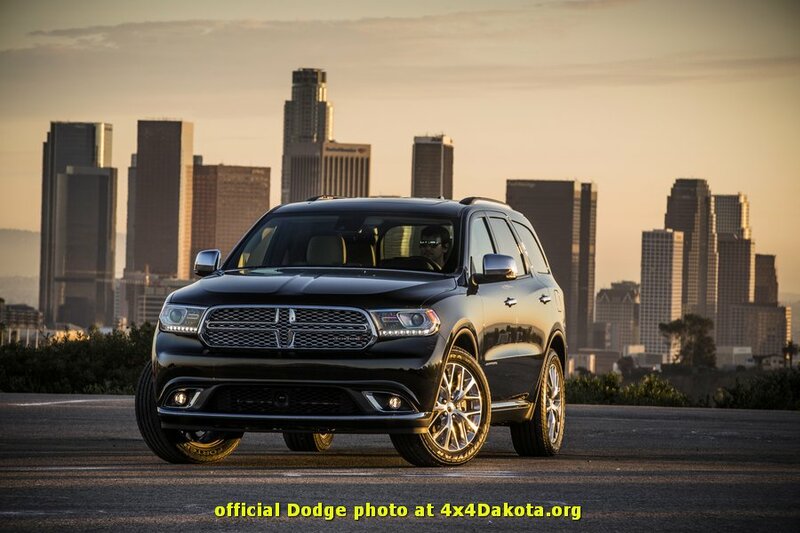 The new 2014 Dodge Durango now features Chrysler Group’s new eight-speed automatic transmission with rotary shifter and steering wheel-mounted paddle shifters as standard equipment on all models. This state-of-the-art transmission improves fuel economy up to 9 percent, along with enhanced performance and smoother shifts. 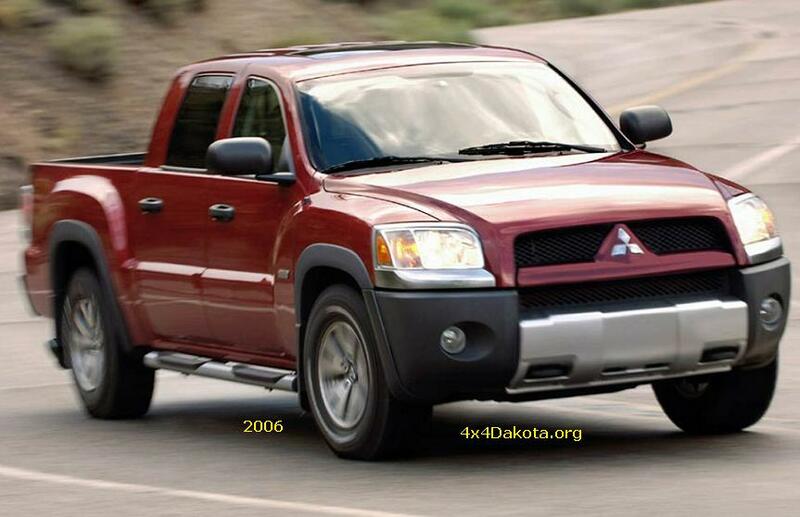 All these attributes perfectly enhance Durango’s fun-to-drive nature. Fully electronic, the eight-speed automatic features on-the-fly shift map changing, with manual shifting capability using steering-wheel paddle controls. More than 40 individual shift maps for specific conditions optimize shift quality and shift points for fuel economy, performance and drivability. The intelligent software is attuned to the performance requirements of almost any driving demand. The transmission efficiency and wide ratio spread provide the best possible fuel economy by operating at a lower engine rpm in both city and highway environments. The addition of more gear ratios also helps reduce the gaps normally associated with upshifting and downshifting. Gear changes are nearly imperceptible due to the evenly spaced gear steps between each gear ratio. Internally, the transmission has four gear sets and five shift elements (multi-disc clutches and brakes). Only two shift elements are open at any time. With fewer open shift elements, drag losses due to multiple parts rotating relative to one another are reduced, improving fuel efficiency. Named one of Ward’s 10 Best Engines for three years, Durango’s standard 3.6-liter Pentastar V-6 engine paired with the new standard eight-speed transmission delivers up to a 9 percent improvement in fuel-economy when compared with the previous transmission, not to mention improved performance. The standard flex-fuel 3.6-liter Pentastar V-6 engine generates an impressive 290 horsepower (295 horsepower on Rallye) and 260 lb.-ft. of torque, and can tow up to a best-in-class 6,200 pounds. The 5.7-liter HEMI V-8 engine produces a best-in-class 360 horsepower and 390 lb.-ft. of torque with a best-in-class tow rating of 7,400 pounds. The 5.7-liter engine’s Fuel Saver Technology with cylinder-deactivation seamlessly alternates between smooth, high-fuel-economy four-cylinder mode when less power is needed and V-8 mode when more power is in demand. This optimizes fuel economy when V-8 power is not required, without sacrificing vehicle performance or capability. 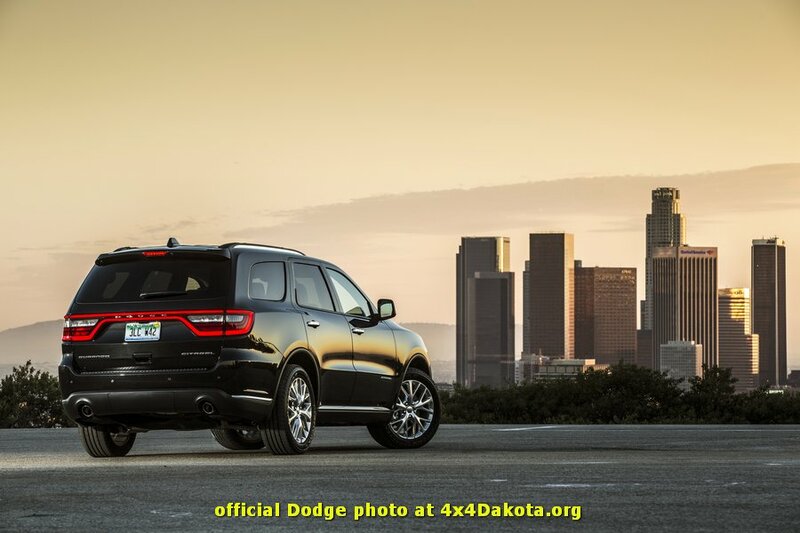 The 2014 Dodge Durango features a new Eco Mode that contributes to its improved fuel economy. Eco Mode optimizes the transmission’s shift schedule, as well as throttle sensitivity, and Fuel Saver Technology with cylinder deactivation in V-8 models, to maximize fuel economy. The Eco Mode also manages interactive deceleration fuel shut-off (IDFSO), which cuts fuel delivery when the vehicle is coasting to reduce fuel consumption. Eco Mode is automatically engaged upon vehicle startup. A button on the Durango’s center stack allows drivers to disengage Eco Mode if more spirited performance is desired. 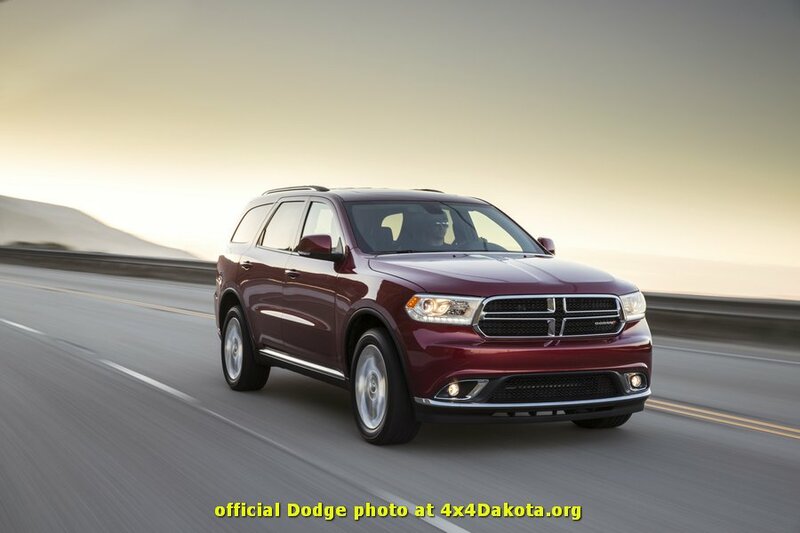 For 2014, Dodge designers are bringing Durango to the forefront of technology in the three-row SUV segment, while taking nothing away from the utility and build quality for which Durango is known. The new instrument panel features a redesigned center stack that houses the new 5-inch and 8.4-inch Uconnect touchscreens. Under these large, easy-to-use touchscreens are redundant button and knob controls for audio and climate functions. The bottom of the center stack houses a new media hub with an SD card slot, USB outlet and auxiliary jacks, as well as a storage bin. The center console features a new segment-first rotary shifter for the standard eight-speed automatic that adds another level of refinement over the traditional gated automatic shifter. Manual shift functions have moved to paddle shifters on the back of the Durango’s new steering wheel. 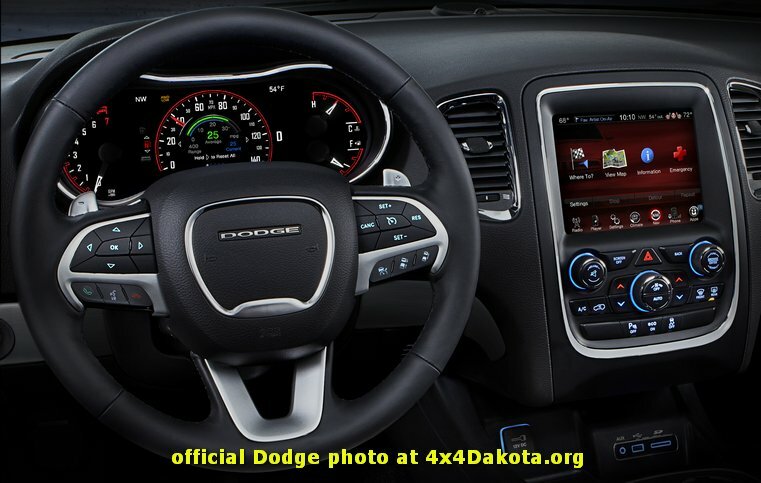 These paddle shifters are standard on all 2014 Dodge Durango models. The instrument cluster has also been given the high-tech treatment and now includes a full-color 7-inch thin-film transistor (TFT) screen similar to the one found in the all-new Dodge Dart. Standard on all models, this screen allows for drivers to customize more than 100 ways how information is presented. Framing the new instrument cluster is a redesigned three-spoke steering wheel with the previously mentioned standard paddle shifters. The buttons to control TFT driver information functions are now larger and illuminated to make them easier to operate. Buttons for Uconnect and phone access now reside along the bottom edge of the vertical spokes. As before, Durango’s popular audio controls are still found on the back of the upper steering wheel spokes. A large lockable glove box has a viscous-dampened hinge, which helps it open and close smoothly. With standard seven-passenger seating and luxurious second-row captain’s chairs available on all models, the seats in the 2014 Durango can be converted to as many as 50 different configurations. The available second-row console features a dual-hinged door/armrest that when flipped forward, features a hard surface so that the armrest is not damaged by cargo. It also offers class-exclusive storage and features, including USB ports for charging electronics. A fold-flat front passenger seat is standard on models that aren’t equipped with the ventilated seat option. By folding forward, the passenger seat provides more utility, which lets customers load and carry long objects. Once flat, the seat back panel also serves as a convenient utility table. A new active head restraint system adds to the long list of available safety and security features. 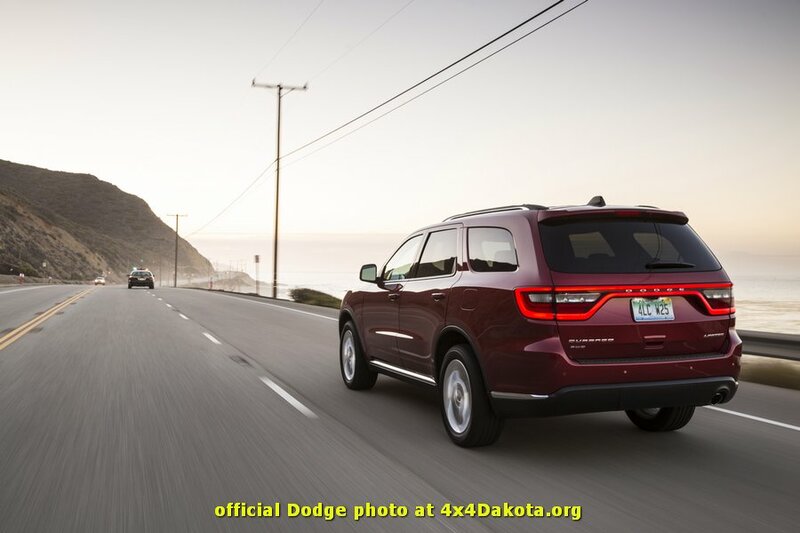 Five-inch and 8.4-inch touchscreens, a customizable 7-inch TFT gauge display, forward collision warning with crash mitigation, adaptive cruise control with stop and the latest generation of Uconnect Access Via Mobile are just some of the 2014 Dodge Durango’s available state-of-the-art features. The forward collision warning system with crash mitigation alerts the driver if they’re approaching a vehicle in front too quickly, and the new adaptive cruise control with stop will keep Durango at a driver-selected distance from the vehicle in front when cruise control is engaged and can even bring the SUV to a controlled stop. Embedded cellular technology that leverages Chrysler Group’s strategic partnership with Sprint allows the latest Uconnect Access system to work its magic. The advanced service-delivery platform affords the kind of stability that enables direct communication when it’s needed most. Uconnect Access connects vehicle occupants directly with police, fire department or ambulance service dispatcher with the push of the “9-1-1” button on the Durango’s rearview mirror – no cell phone needed. The same logic works for roadside assistance. One push of the “ASSIST” button summons help directly from Chrysler Group’s roadside assistance provider or the Vehicle Customer Care Center. In the 2014 Dodge Durango, customers can put away their smartphones, keep their hands on the steering wheel and still interact with their devices in the ways to which they are accustomed. Media apps from Pandora to iHeartradio to Slacker are all available via voice command – a function of Uconnect’s powerful, Cloud-based voice recognition capability. Additional convenience is achieved when Uconnect syncs a customer’s existing app so their favorite artists and stations are available at the touch of the screen, or by the sound of their voice. The Durango’s navigation system also features new 3D maps with graphic representations of well-known landmarks and terrain, designed to make on-road travel even easier to navigate. Durango also has the ability to be used as a Wi-Fi hot spot. A powerful Bing search engine can be used via voice command if the driver needs to find a destination. Uconnect navigation then calculates a route and stores the destination’s telephone number for handsfree calling. A new 5-inch touchscreen is now standard on SXT models and controls audio, climate, phone and other vehicle functions, such as turning on the heated seats or determining how long the headlamps stay on after the ignition has been turned off. The high-resolution screen is intuitive and easy to use, yet redundant controls for audio and climate can be found below the touchscreen for drivers who prefer the classic dial approach. Standard on Limited, R/T and Citadel models (and available on SXT and Rallye) is the award-winning 8.4-inch Uconnect touchscreen that controls audio, climate, phone, vehicle functions, navigation (if equipped) and the new Uconnect Access system. This system provides large, easy-to-read graphics – including new 3D mapping – with intuitive, easy-to-use controls. The most looked at area of the interior, the instrument cluster, also has a new premium high-tech appearance with the new dynamic gauge cluster. Standard on all models and featuring a customizable 7-inch thin-film transistor (TFT) liquid-crystal display, the cluster can be configured more than 100 ways for the ultimate driver-customized experience. Navigation, audio and fuel economy information and warning indicators can all be displayed in the 7-inch screen. Mounted on the back of the front seats is an available all-new class-exclusive Blu-ray video rear entertainment system. This new system features two high-resolution 9-inch screens, one on each front seat back. Each screen offers four-times better resolution when compared with previous models and allow customers to watch their movies on Blu-ray or standard DVDs or play their high-definition media interface (HDMI) gaming systems via inputs for HDMI cables or RCAs for each screen integrated into the front seat backs. Wireless headphones are included as is a wireless remote. 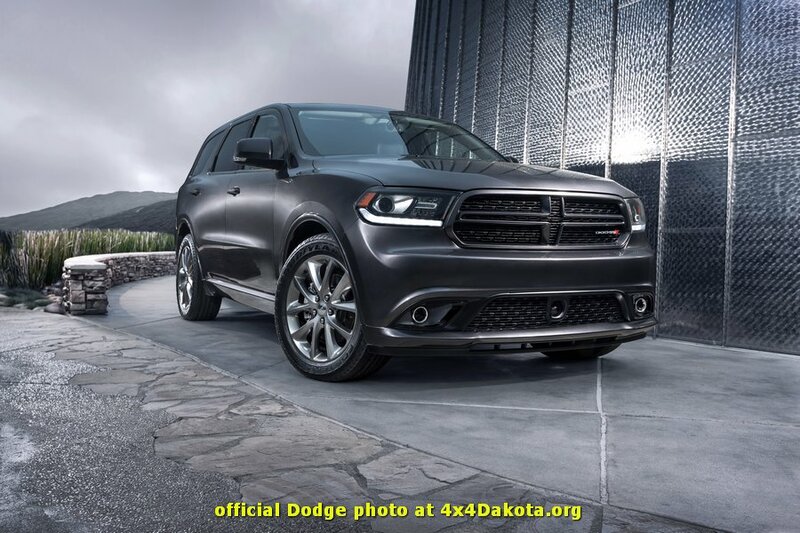 The new 2014 Dodge Durango offers consumers more than 60 available safety and security features, including standard all-speed traction control and electronic stability control (ESC), which improve overall vehicle handling and performance both on- and off-road. Standard trailer-sway control enhances towing capabilities and keeps the vehicle and trailer aligned as the Durango travels down the road. Safety and security features available for the first time on the Dodge Durango include forward collision warning with crash mitigation, adaptive cruise control with stop, Uconnect Access with 9-1-1 call and roadside assistance. Blind-spot Monitoring (BSM) and Rear Cross Path (RCP) detection, which aid drivers when changing lanes or in parking lot situations, are also available. In addition, standard front-row active head restraints, standard full-length three-row side-curtain air bags and standard front-seat-mounted side thorax air bags offer enhanced occupant protection to passengers in the event of a collision. In total, Durango offers seven standard airbags. The 2014 Dodge Durango will be built in the United States at the Chrysler Group LLC’s Jefferson North Assembly Plant (JNAP), where the Durango has been produced since 2010 when the third-generation Durango was reintroduced for the 2011 model year. It is built on the same assembly line as the most-award winning SUV ever – the Jeep Grand Cherokee – which has been built at JNAP since the facility opened its doors in 1992. One of only two assembly plants located entirely within Detroit’s city limits, Jefferson North has been boosting its employment levels since June 2009. JNAP has added more than 2,200 employees on two shifts in the past 4 years, bringing total plant employment to nearly 4,700. The plant runs six days a week, 20 hours a day in order to keep up with demand of the hot-selling SUVs.